Pomerania is an area that curves along the Baltic Sea in far northern Europe. Ruled by or part of different countries or kingdoms, including Prussia, over the centuries, it was Germanic in culture at one time, due to settlement by German farmers. Today it is split along the Oder River, the west part now in Mecklenburg, Germany, the east in Poland. 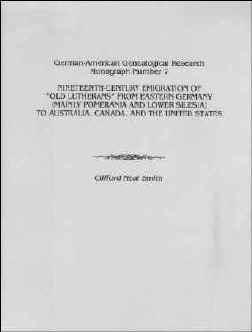 From Cammin in Pomerania and other areas of Prussia came a unique migration of "Old Lutherans" to America in 1839, searching for religious freedom. Many settled in and around Buffalo, New York, while about 60 families came on to Milwaukee, Wisconsin, and surrounding areas. Among them were several Bruss families from Cammin. Here's more on Cammin, Pomerania, and the Old Lutheran migration. Pomerania: basic facts, genealogy, geography, history, more, and the griffin insignia, logos and maps of Pomerania. Pomerania Maps for mid-19th century, 1871 to 1918, and 1938. One shows it is 1/5th the area of Wisconsin. Pomerania stretches 175 miles east to west and 50 miles north to south. 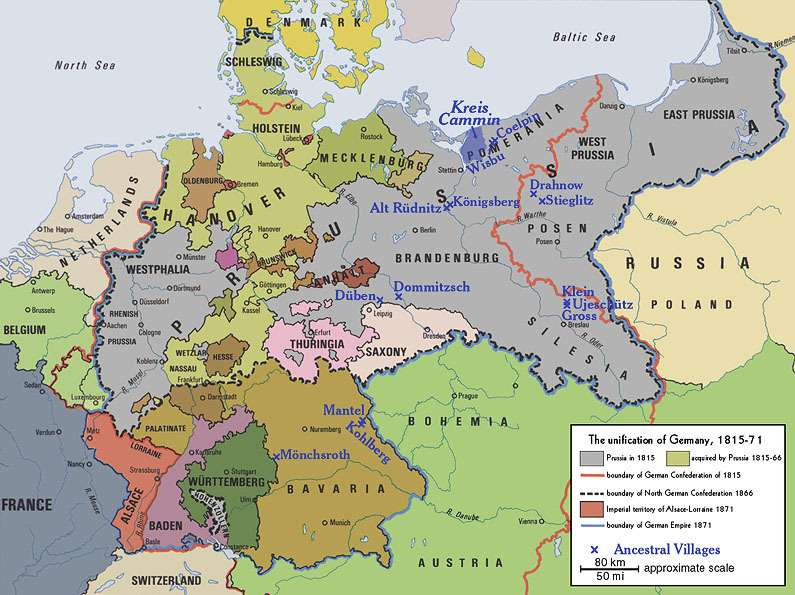 Since 1945, western Pomerania joined Mecklenburg, Germany. History of Pomerania: a region alternatively Germanic and Slavic, fought over by Denmark, Sweden, Vikings, Poland, the Holy Roman Empire, the Teutonic Order, Brandenburg, Prussia and Germany. History of Pomerania, including the section west of the Oder River called Vorpommern now joined with Mecklenburg, and part east of the river called Hinterpommern. Mentions the Old Lutheran emigration. Short History of Pomerania, with 8 chapters, with one on Pomerania as a Province of Prussia, 1815-1945. Old Lutherans are mentioned. History of Pomerania, its Christian churches and its church organs, including the one built in Cammin, 1669-1672. Family Research in Pommern, genealogy resources in English translation. Original in German is Familienforschung in Pommern. Kreis Cammin genealogy resources including Web pages, books, genealogy e-mail lists, more. And contact details for Prof. Dr. Hans-Dieter Wallschläger, noted author about Kreis Cammin. Kartenmeister: database of places, surnames, researchers for Eastprussia, Westprussia, Brandenburg, Posen, Pomerania, Silesia. Pommern-L is a genealogy mailing list for Pommern, messages in English or German. Pomeranian surnames and their researchers. Cammin, also spelled Kammin, overlooks the Dievenow River, a branch of the Oder River near its mouth at the Baltic Sea. It is or was the seat of the bishopric, the site of a cathedral built in 1175, a Hanseatic trading and shipbuilding city, and a health spa. See city photo and a city panorama. Cammin or Kammin : a port city in Kreis Cammin near the Baltic Sea with four Lutheran churches including a Dom or cathedral. Map of Pomerania, large. See Kammin just inland from Mth. or Mouth of the Dievenow River where it enters the Baltic Sea. Also a map with the city of Cammin in Kreis Kammin and large map of Kreis Cammin. Map of Pomerania, 1871, with Kreis Cammin highlighted in blue, and a map of Land Kreis Cammin showing the city, the river, more. 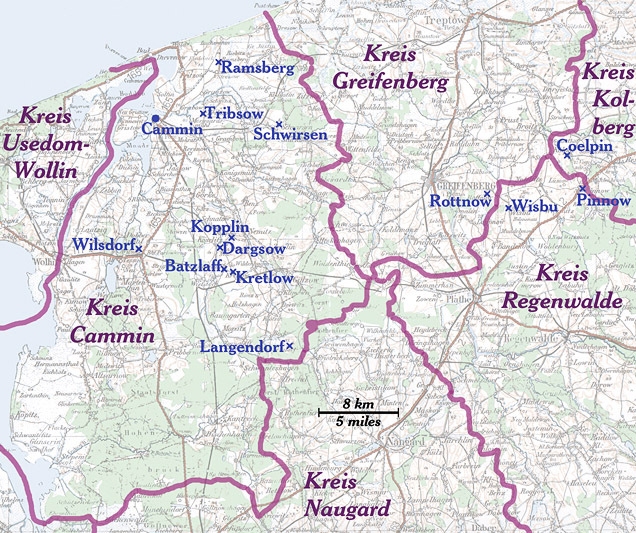 Modern map with Kreis Cammin outlined, city of Cammin shown, and a map showing Cammin/Kamien Pomorski and Insel Gristow to the west, and maps of Land-Kreis Cammin and of Pomerania with Cammin to the far right, with Gristow Island with Gristow and Bunnewitz on it. Cammin, once a Hanseatic League trading city, with photo. Kammin listed as a Hansa town on page x in the book The German Hansa by Phillipe Dollinger, D. S. Ault, H. Steinberg. View it on Google Books. Hanseatic towns in Poland, some formerly in Pomerania, with history and description in words and photos, including Stettin/Szczecin, Cammin/Kamien Pomorski, Danzig/Gdansk, more. Another look. Cammin in Pommern [English translation]: brief history plus images of the historic cathedral and city hall. [Original version]. A brief history. Der Kreis Cammin in Pommern with photos including Cammin in 1915 [in German] and Kreis Cammin in Pommern [English translation]. Dom or Cammin Cathedral. Dom exterior, altar and organ. Kammin, Pomerania: once part of Prussia, Cammin or Kammin has been part of Poland, in its far northwest corner, since the end of World War II. It is now called Kamien Pomorski. A visit to Cammin today. Search via Google Books for Heinz Chinnow's Pomerania: A Teenager's Diary of Peace, War, Flight and Expulsion. See p. 131 for a brief description of Cammin today and author's genealogy research. Cammin today is Kamien Pomorski, known for its Gothic cathedral, spa, music festival, Gothic town hall and ancient city gate. See photos. Kamien Pomorski, in English, with description of historic churches, the 1669 organ, Wolin Gate and Tower, St. John the Baptist Cathedral. Plus a sideview of the cathedral. Map of the city of Kamien Pomorski today, with a photo gallery. Photos: Wolin Gate and Piast Tower from the old medieval walls,, the Cathedral, the Cathedral's organ, another Cathedral view, a side view of the Cathedral , historic Rathaus or Town Hall, Staromiejski Hotel in the Old Town, views of St. Nicolai's Church [see bottom], and several Cammin photos including the Rathaus or town hall..
Northern Germany's famous Brick Romanesque, Brick Gothic and Brick Renaissance architecture, for a region without stone resources. A total of 1,084 Old Lutherans arrived in America in the fall of 1839 on seven ships: Franklin, Caroline, Alfred, Britannia, Republic, Georgiana and Echo. Links to passenger lists included. Emigration Index to Wilhelm Iwan's 1943 book "The Old Lutheran Emigration at the Middle of the 19th Century." Search here. Martin Friedrich Bruss family from Cammin on page 250 here. Pomeranian emigration to Wisconsin: a history of those who came from the Cammin and Stettin areas to the Milwaukee area in 1839. Most bought farm land to the north, but some stayed in the city. More came from Pomerania in the 1850s, 1860s. Pommerscher Verein Freistadt preserves German Pomeranian culture in SE Wisconsin, offers large family pedigree database. Pommersche Tanzdeel Freistadt of Wisconsin performs Pomeranian music, dance. See photo gallery showing costumes. Learn more about this cultural group, pronunciation of its name and related history. How German is American? A look at clubs set up by German immigrants, such as the Turnverein, and mentions New Berlin, New Glarus, New Holstein, Milwaukee, Plymouth, Watertown plus an introduction to German-American identity, typically submerged rather than overt. Timeline of German Groups in America: from Germans at Jamestown in 1607 through many groups that migrated including the Palatines in 1709, Amish in 1809, Old Lutherans in 1839 and many more. German-Americans: the largest self-reporting ethnic population in America, at some 50 million in the year 2009. See chart for 2000. German was the No. 1 ancestry in 23 states in that census. The top 6 states for German-American ancestry in 2000 by percentage of population were North Dakota, Wisconsin, South Dakota, Nebraska, Minnesota and Iowa. 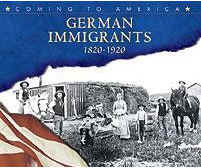 Most German immigrants came between 1840 and 1920. German immigration started an upswing in the 1830s and for 60 years was never less than 25 percent of all immigrants, peaking in the 1850s. Learn more and see chart of immigration by decade. German Originality: about German- American heritage and immigration to America in the 1600s, 1700s, 1800s, 1900s and today. German-American History & Heritage: includes biographies, books, more and German-American Historic Sites & Museums, by state. The "German belt" states -- Wisconsin, Minnesota, North Dakota, South Dakota, Nebraska, and Iowa -- have the most dense German-American populations. A Bit of Germany in Early Wisconsin: a 1927 article recalls the settling of New Holstein by Germans who sailed for America in April 1848. Their journey to Sheboygan and New Holstein is described. German-American Dialects are outlined and shown on an interactive map with links between parts of Germany and areas of Wisconsin. Visit our Genealogy Shop for family history and genealogy books, software and other products today. Check out the sections for German genealogy, Irish genealogy and more. When you click this banner & shop, you support Best Dog Free Stuff!